Hardback. Collector's Edn. Enter the dark streets of Victorian London, east-end life, and unsolved mysteries with this intriguing insight into the notorious Jack the Ripper murders. From the gruesome murder reports to a detailed look at the suspects, the Memorabilia Collection is an investigation of one of the world's most infamous unsolved crimes. 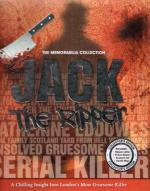 Includes : Ripper Letter, Police Report, Suspect List and Death Map. Profusely Illus. in colour and b/w. 96pp. 8vo. Cased spiral binding. Nr. F. Fairly heavy and will require additional postage if shipped overseas.